I have taken on some challenges next year that I would like to share with you. The first on is a reading challenge!!! I am reading 20 or more books I already own as part of the Contentment Reading Challenge I will be posting reviews of everything I read so check back for lots of reviews. I memorizing the book of 1 Peter as part of Meditations of His Love challenge and the 52 verses challenge!! Would you like to join me for one of more of these challenges? I would love you too!! Wow! Good for you Sarah!!! :D I'm so proud of you taking on all these challenges. 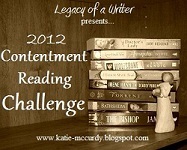 I can't wait to see what you'll read in 2012!